Marcus "ThorZaIN" Eklöf is a Terran player for Starcraft II, and a Human player for Warcraft III. While not a very big name in WC3, ThorZaIN caught peoples' attention in SC2 after defeating NaNiwa 4:3 to win the TeamLiquid StarLeague 3. At present, ThorZaIN is ranked #901 in highest overall earnings, and #57 in highest earnings for players from Sweden. 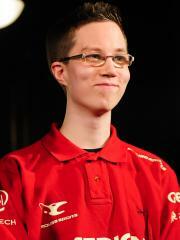 Before ThorZaIN turned 18 years old, he earned $554.02 in cash prizes from a single tournament. 0.52% of his total prize money was earned before February 9, 2009. The most money that ThorZaIN has won from a single tournament was $15,000.00 from TSL 3 on May 15, 2011. He placed 1st, making up 14.05% of his total prize money won. ThorZaIN obtained $100,000 in total prize money earned on October 6, 2013 with a $2,000.00 cash prize from his 9th-12th place finish at WCS Europe 2013 Season 3 Premier. Prize money from 58 tournaments got him to that point. In the last 90 days, ThorZaIN has won $279.50 in cash prizes from a single tournament, none of which came in the last month.